inscription: Printed at the bottom left: "Printed by Warren''s Waller Press " with address and funding information along with a GAU union label. 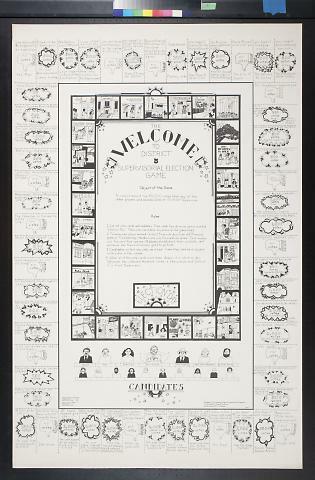 Printed at the bottom right: "designed by: Eric Graham, Roberta Twidwell and Margaret Li / illustrated by: Roberta Twidwell" with sponsorship information and "(c) 1977". Poster has black ink printed on white paper. Around the edges are spaces for a board game, with text and images. At the center is "The Welcome to District 5 Supervisorial Election Game" with the object of the game and instructions. Candidates are illustrated near the bottom.